If you like chocolate covered mint candies you are going to love these Chocolate House whipped creme trees. Unlike the whipped creme snowman and Santa's , the Christmas trees have a mint creme center. 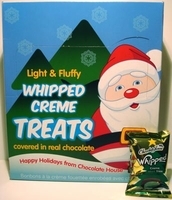 These are one of our most popular whipped creme treats and sell out quickly. 24 individually wrapped trees per box, made in the USA.